Akshaya Patra and the Infosys Foundation's journey together began several years ago. During this time the Infosys Foundation has been a staunch supporter of Akshaya Patra’s work to end classroom hunger in India. Today N.R. 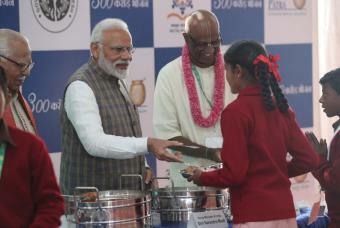 Narayana Murthy, Founder of Infosys Limited, is on the Advisory Board of Akshaya Patra’s US chapter, while his wife Sudha Murty, Chairperson of the Infosys Foundation actively facilitates the organisation’s mid-day meal programme. By generously lending its voice to the programme, and providing constant expertise and financial support, the Infosys Foundation has been a driving force in taking Akshaya Patra’s mid-day meal programme to new heights. The Infosys Foundation, launched in 1996, operates as a not-for-profit organisation that works to create opportunity and an equitable society. The Foundation currently supports programmes across education, healthcare, rural development, arts and culture and destitute care.